Driving the latest BMW M5 is all pleasure. Guiding this car swiftly from point to point is easy and a heap of fun. Enjoyment is gained from spending time at the BMW M5 Wheel, and this is why daily drives can be injected with loads of speed via a twin-turbo, V8 BMW Motorsport engine. Shatteringly quick, the BMW M5 sedan is also about comfort. You’ll find all the latest automotive technology inside the new BMW M5, and you’ll enjoy the doo-dads from what are some of the best seats you’ll find anywhere… including your lounge recliner! Performance needs some boundaries. 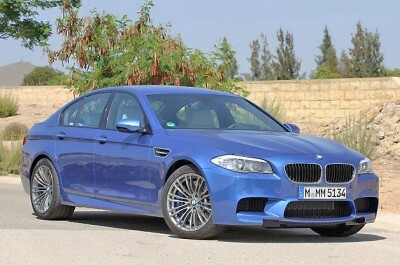 What the BMW M5 offers is responsive steering, massive roadholding and mammoth brakes. All of these assets enable the M5 to have phenomenal cornering and stopping power as well as extraordinary acceleration. BMW has had a decent time frame to give the complicated M high-performance chassis a completely new redevelopment. What we have now, is a BMW M5 sedan with untouchable driving dynamics and agility. One of the new developments in the BMW M5 chassis is the use of aluminium componentry in the front struts and localised stiffening of the front of the car to optimise stability and quicken steering response. It’s no wonder you feel like a Formula 1 racer when working the M5 through its paces. BMW V8 muscle socks a big punch, and with an M TwinPower Turbo V8 engine and the 7-speed M double-clutch transmission with Drivelogic, the new BMW M5 harnesses the full potential of the 680 Nm of torque and 412 kW power from the engine. Getting to 100 km/h from a standstill takes as little as 4.4 seconds. At 100 km/h you feel like you’re just getting past a stroll in the park. And when you hit 200 km/h (which doesn’t take long), the big M5 is as sure footed and well balanced as you could wish for. Acceleration at 200 km/h is still very strong, and will send you up to the 250 km/h limited top speed with ease. I’d love to know what the car could do with the limiter unhitched. Surely north of 300 km/h would be easy enough. Ever since the first BMW M5 sedan was invented, the back seats offered a sensible amount of room. Today that rear leg, head and shoulder room is bigger, and you really feel very spoilt lazing back into some very soft (but supportive) Nappa leather seats. Up in the front, the M seats have their moulded side supports, and the overall spaciousness of the M5’s interior exceeds that of other sports cars – by a long chalk. Four passengers travel in complete comfort. Electric windows, keyless entry, a hands free phone, satellite navigation, climate control, electric seats, head and torso airbags, Heads-up display, leather seats, a wonderful audio system, active safety systems…the list goes on – making the BMW M5 the ultimate driving machine, in my book. The aluminium paddle shifts, to the right and left of the steering wheel, work well and look the goods. The M instrument panel displays all of the most important data. BMW has fitted the M5 with Head-Up Display, and the driver is shown important information about the car’s speed and gear selection. BMW has incorporated into the M5 the ‘EfficientDynamics’ system which works the Auto Start Stop function and Brake Energy Regeneration. With such breathtaking performance, it is quite remarkable to find that the BMW M5 manages an excellent combined fuel economy of 9.9 litres/100 km. It is a little thirsty around town, but on the open road, the 7.6 litres/100 km is amazing. Be in quick because the BMW M5 is a very desirable car. For any more information on the BMW M5 or, for that matter any other new car, contact one of our friendly consultants on 1300 303 181. If you’d like some fleet discount pricing (yes even for private buyers! ), we can submit vehicle quotes requests out to our national network of BMW dealers and come back with pricing within 24 hours. Private Fleet – car buying made easy!